Baby pirate themes for the nursery are full of fun and adventure whether you're a fan of Pirates of the Caribbean or Treasure Island. 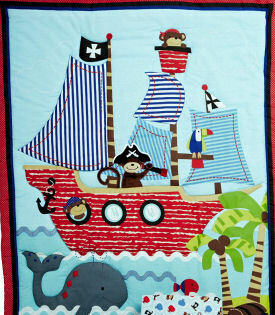 We have lots of decorating ideas for a pirate nursery theme to share with you so let's get started! In addition to the best pirate baby bedding sets, we have some nursery pictures that will give you some tips on how to decorate your baby's room in the swashbuckling pirate nursery theme of your choice, one that can easily transition into a big kid's bedroom. Hop aboard, matey and let's finish this project before the baby arrives. After you make decision on which bedding you like, you can do all kinds of amazing things like this wall painting. The combination of a sock monkey and pirate theme is an interesting concept. The nursery colors are set and it's time to buy decorations. 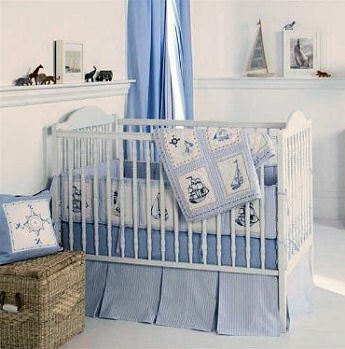 Some items were most likely included with the crib set but before you fill the room with "match-y matched" stuff, consider decorating the nursery with some (baby safe only, please) items that will make your design truly unique and one-of-a-kind. A vintage pirate treasure chest made of distressed wood with an iron skull latch will add to the decor and will come in handy for storage. Use the space to organize baby's clothes, toys and control the clutter. Use signs and banners left over from a pirate baby shower as nursery wall decorations. Personalize the pirate flag banner with baby's name and use it to decorate the wall or as an enhancement for the nursery window valance. 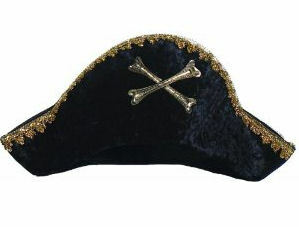 Does your husband has a pirate costume that he insists on wearing to every party at Halloween? 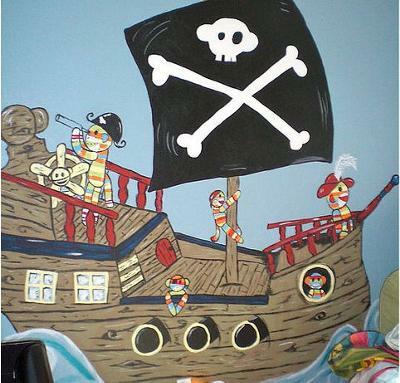 Baby's pirate theme nursery will offer an opportunity for dad to enjoy his beloved pirate hat year round as well as solve some storage issues. Include it in a shelf display with a vintage, brass spyglass and a replica of Captain Hook's hand. 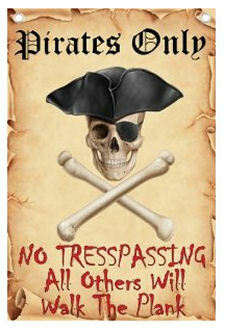 Pirate flags and signs can be personalized with baby's name or send a message to visitors. 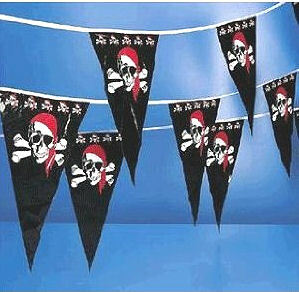 Jolly Roger flags and room signs cover a large area for a very cheap price and can be relocated to the tree house or fort in your back yard when the pirate theme nursery is ready for a makeover. 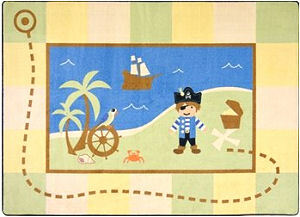 A treasure map is another popular choice in wall art for a pirate baby nursery. There's no need to figure the price of having your artwork unless you want to, of course. Pirate treasure map wall stickers are less expensive, removable and you can have the fun of creating your own pirate nursery mural. 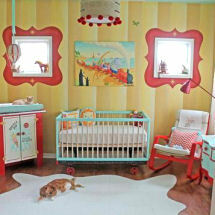 Another place in a baby's pirate theme room where we often see treasure maps would be on the floor. 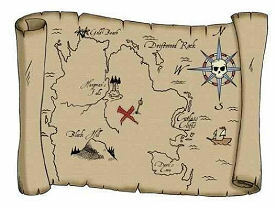 A map leading the way to buried treasure is cute and gives baby a soft place to crawl and play. You can easily make your own pirate treasure maps with little more than an old sheet or some brown paper bags. Simply take the brown sack apart at the seams and press it flat. Draw the details of your treasure map with a piece of charcoal including a dotted line leading to the buried treasure and a few graphics pointing out landmarks along the way. After your drawing is complete, use a lighter to singe the edges of your artwork and then crinkle it to give it the look of old leather. Please make plans to visit Unique Baby Gear Ideasagain soon to see more baby pirate theme nursery designs and decor that you can make yourself.